During the product development phase we analysed precisely what functional elements, such as pockets, were absolute necessities in this innovative type of workwear. The special feature of the uvex suXXeed trouser family is the different fits in which the range comes: for example, our regular fit, where the cut of the trousers is neither particularly narrow nor wide, is our absolute classic. The trousers also come in a slim fit version, which is sportier and more close-fitting. The use of 4-way stretch material ensures that both these versions guarantee complete freedom of movement. All the trousers also have a stretch waistband and reinforced cordura fabric patches where they tend to be most needed. Integrated yardstick, mobile phone and tool pockets provide sufficient storage room to hold all the kit needed, from spanners to climbing gear as well as a smartphone. At a certain point we also asked ourselves what items of outdoor clothing might also be suitable for workwear? A new trend in items such as hybrid jackets is the use of robust fabrics in combination with breathable stretch inserts. This is a feature that we have incorporated in our uvex realworker jacket. The design of this jacket borrows the “high rise” sleeve construction, which is already popular in outdoor leisure wear. It ensures that the jacket remains in place, even when arms are raised above the head. The breathable stretch inserts are also used for the back area. A further on-trend product is the new uvex suXXeed hybrid weather jacket, which features comfortable padding for chest and lumbar support. Of course, such trend-setting clothing must also be correspondingly showcased and so when the collection was finally complete, a photoshoot was organised for the new uvex 2018 catalogue. Firstly, all the models were photographed individually in various settings at the Nuremberg studio. For this, we needed a well-thought-out plan. Items had to be selected and prepared beforehand to ensure that they were in perfect condition for the studio shots. Then it was off to the great outdoors for the location shoot up high: all of us, including the models, had to get up at an ungodly hour in order to make the most of the views over a mountain in Saalbach Hinterklemm at sunrise. We think the results are worth it! We are convinced that we have struck the right chord with the uvex suXXeed range – and the international jury of independent experts of the Plus X Awards agrees too. 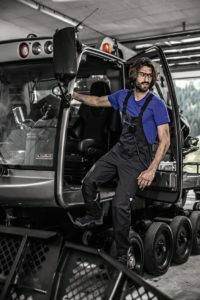 The major global innovation prize for technology, sport and lifestyle was awarded to uvex as the “Brand of the year for 2017” in the “Workwear” category. The regular fit cargo pants and the realworker jacket in the uvex suXXeed collection also won awards for high quality, design, functionality and ergonomic design in the “Sportswear” category. What do you think? In reality, shouldn’t all workwear be as trendy and as much fun as uvex suXXeed? We would love to hear your thoughts, so please do leave us a comment!